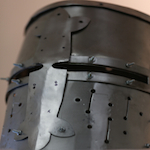 Just thought it might be interesting to share a couple of pictures from a helm that I've been working on for a few days. I've never made a helm, so I thought it would be enjoyable to try. I did my best to replicate a helm depicted in the illustrations of the Maciejowski Bible. Aesthetically, there might be much to be desired as I didn't try to planish away much of the rough hammer marks, and the edge on the top could have been straighter. It's 16 gauge mild steel and quite heavy. I haven't weighed it, but it's probably around 4-5 lbs. I was considering adding a leather liner, but finally decided on simply wearing a padded linen coif that is not attached to the helmet. I hope these images show up, first time posting pics. Great work, especially considering it's your first. Are you planning to fight in it? Thanks, Scott! No plans to fight in it. I can't imagine how anybody could take the abuse to the ears, to be honest. It rings pretty loudly inside when struck. Attaching a leather or foam liner will dampen the noise in additional to making it more secure to the head. You really don't want it to twist sideways thus blinding you in combat. Nice job by the way. Looks good. If you do another I’d recommend a vertical piece in the centre of the eye slot. I have a leather liner in mine and wear a padded cover directly on my head as well. I see you’ve already thought about the noise.